Protesters, now including workers, farmers, police, soldiers, and members of the League of Communists of Yugoslavia, along with the students, continue to demonstrate, and in greater numbers, demanding the release of those arrested earlier and more. Some say that Kosovo should be a Yugoslav republic, instead of an autonomous province, or join Albania. Many Serbs agree with Tihomir Vlaskalic, president of the Central Committee of the Serbian LCY, who says, “We have taken it for granted that Kosovo has its own Republic in Yugoslavia—the Socialist Republic of Serbia.” On March 26, students in Pristina attack Serbs and Monenegrins, and rob and burn houses and businesses. Students in Podujeve, Vucitern, Gjakova, Gjilan, Ferizaj, and Mitrovice join in on April 1-2. Serbia calls in the Yugoslav police and army and fighting occurs during a state of emergency, prohibition on gathering, and a curfew on April 2, throughout Kosovo. Thirty thousand soldiers and tanks are deployed, which some Albanians see as an occupation. Kosovo LCY President Mahmut Bakalli urges the military and police not to guard the radio and TV studios, because it would inflame the public. The last large demonstration is the May 18 occupation of Pristina University dormitories, which is ended by police using tear gas on May 19. The university is closed and its University Council is disbanded. High school students are expelled for demonstrating. More than 1,000 LCY members will be expelled or unilaterally removed from membership, and 11 LCY basic organizations will be disbanded during the emergency measures. Two months later martial law will end, but major towns are patrolled by security forces and covert officers of the Yugoslav Ministry of the Interior afterward. Casualties - From March 11 to April 2, nine Albanians and a Serb policeman are killed, according to the Yugoslav government. 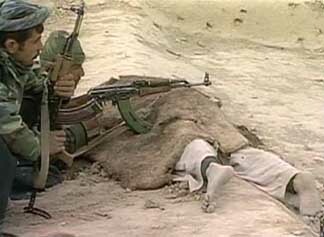 In 1989 a Yugoslav source will say the wounded include 75 Albanians (55 of whom were wounded by gunshots), three militia with serious injuries, and 127 with less serious wounds. Kosovar Albanian sources say as many as 1,000 are killed and even more hurt. Amnesty International will later say that the Serbian LCY Central Committee was told more than 300 were killed. In 1992 the Council for the Defense of Human Rights and Freedoms, located in Pristina, will find only 13 Albanians known to have been killed. Government Countermeasures - Around 1,400 Albanians are given prison terms of up to 15 years, 3,000 given sentences of up to three months in prison, and 6,000 are otherwise punished. During the summer break, almost 300 students are given trials as brief as a few hours, and given up to 15-year prison terms. In June, the government says 506 people were summarily fined or jailed for up to 60 days under the Code for Petty Offenses. By August 31, another 245 people are given one to 15-year prison terms by the federal authorities and 60 people are convicted in September. The education minister of Croatia and other Croatian and Slovenian authorities will say Serbia should be less draconian. Many professors will be blacklisted in the Komunist magazine. The Kosovo Committee of the LCY calls for a 10 percent smaller student body at Pristina University and dispersal of some departments elsewhere in the province. When the fall semester begins in September, Albanian history, literature, language, culture, and art courses will be censored. Translated Serbian textbooks replace uniformly banned textbooks from Albania. The number of Albanian students, and their former quota of two-thirds of the student body, will be reduced annually. ’Nayirah’ testifying before Congress. [Source: Web Fairy (.com)]An unconfirmed report of Iraqi soldiers entering a Kuwaiti hospital during the Iraqi invasion of Kuwait (see August 2, 1990) and removing newborns from their incubators causes a sensation in the US media. The rumor, which later turns out to be false, is seized upon by senior executives of the PR firm Hill & Knowlton, which has a $11.9 million contract from the Kuwaiti royal family to win support for a US-led intervention against Iraq—the largest foreign-funded campaign ever mounted to shape US public opinion. (Under the Foreign Agents Registration Act, the firm should have been held accountable for its marketing campaign, but the Justice Department fails to intervene.) The firm also has close ties to the Bush administration, and will assist in marketing the war to the US citizenry. [Christian Science Monitor, 9/6/2002; Independent, 10/19/2003; Public Relations Watch, 6/3/2007] Hill & Knowlton uses a front group, “Citizens for a Free Kuwait” (see August 11, 1990), to plant the stories in the news media. Congressional Hearings - Hearings on the story, and other tales of Iraqi atrocities, are convened by the Congressional Human Rights Caucus, chaired by Representatives Tom Lantos (D-CA) and John Porter (R-IL). Reporters John Stauber and Sheldon Rampton will later characterize the caucus as little more than an H&K-funded sham; Lantos and Porter are also co-chairs of the Congressional Human Rights Foundation, a legally separate entity that occupied free office space in Hill & Knowlton’s Washington, DC offices. The star of the hearings is a slender, 15-year old Kuwaiti girl called “Nayirah.” According to the Caucus, her true identity is being concealed to prevent Iraqi reprisals against her or her family. Sobbing throughout her testimony, “Nayirah” describes what she says she witnessed in a hospital in Kuwait City; her written testimony is provided to reporters and Congressmen in a media kit prepared by Citizens for a Free Kuwait. “I volunteered at the al-Addan hospital,” she tells the assemblage. “While I was there, I saw the Iraqi soldiers come into the hospital with guns, and go into the room where… babies were in incubators. They took the babies out of the incubators, took the incubators, and left the babies on the cold floor to die.” [Christian Science Monitor, 9/6/2002; Los Angeles Times, 1/5/2003; Public Relations Watch, 6/3/2007] The hearings, and particularly “Nayirah’s” emotional tale, inflame American public opinion against the Iraqis (see October 10, 1990 and After) and help drum up support for a US invasion of Iraq (see January 9-13, 1991). British Ministers Monitored - Frost cites an instance where then-Prime Minister Margaret Thatcher monitored two of her own ministers (see 1983). New information shows that Saddam Hussein was not captured (see December 14, 2003) by US forces through the auspices of an informant, as previously reported (see December 17, 2003), but was apparently captured by Kurdish paramilitary forces and turned over to the US. The day of Hussein’s capture, Kurdish media reported that a “special intelligence unit led by Mr. Kosrat Rassul” had captured Hussein. The source of the reports was Jalal Talabani, the leader of the Patriotic Union of Kurdistan (PUK). Iranian news services picked up and expanded on the reports. The next day, a member of Iraq’s Governing Council, Dr. Mahmoud Othman, confirmed the Kurdish claims, as did other independent observers. Subsequent Arab news reports indicated that Mohammed Ibrahim Omar al-Muslit, the so-called informant, actually drugged Hussein and told US forces where to find him. But this story, too, is quickly disputed, with experts believing that Kurdish forces intervened, first acting as negotiators for the US, then bypassing the al-Muslit family and seizing Hussein on their own. Once the Kurds had Hussein, they negotiated with the US to stage his “capture.” It is likely that Hussein was drugged, but by the Kurds and not by al-Muslit. One photo of US troops in front of Hussein’s “spider hole” features ripe dates and drying sausage in the background, which usually exist only in late summer, not December as was the announced date of Hussein’s capture. 'Dragnet' - In July, the US Army captured Adnan Abdullah Abid al-Muslit, identified as “one of Saddam Hussein’s closest bodyguards and collaborators.” The al-Muslit family was apparently helping to hide and protect Hussein; later, one of the family members, Mohammed al-Muslit, was identified as the informant who gave up Hussein’s location to US interrogators. In August, another al-Muslit family member, later identified as Adnan al-Muslit’s brother, was arrested by Iraqi police and given over to US forces. The brother was picked up as part of a larger “dragnet” for anyone with possible knowledge of Hussein’s whereabouts. A Four-Hour Tour - During the three-hour flight from Andrews Air Force Base to Cuba, the analysts are given several briefings by various Pentagon officials. After landing, but before being taken to the detention facility, they are given another 90-minute briefing. The analysts spend 50 minutes lunching with some of the soldiers on base, then begin their tour. They spend less than 90 minutes viewing the main part of the Guantanamo facility, Camp Delta; in that time, they watch an interrogation, look at an unoccupied cellblock, and visit the camp hospital. They spend ten minutes at Camp V and 35 minutes at Camp X-Ray. After less than four hours in Guantanamo’s detention facilities, they depart for Washington, DC. [Salon, 5/9/2008] This is the first of six such excursions, all designed to prepare the analysts for defending the administration’s point of view and counter the perception that Guantanamo is a haven for abusive treatment of prisoners. During the flight to the facility, during the tour, and during the return flight, Pentagon officials hammer home the message they want the analysts to spread: how much money has been spent on improving the facility, how much abuse the guards have endured, and the extensive rights and privileges granted to the detainees. President Bush signs the Military Commissions Act into law. 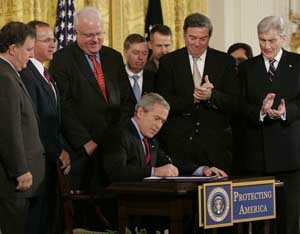 [Source: White House]President Bush signs the Military Commissions Act (MCA) into law. [White House, 10/17/2006] The MCA is designed to give the president the authority to order “enemy detainees” tried by military commissions largely outside the scope of US civil and criminal procedures. The bill was requested by the Bush administration after the Supreme Court’s ruling in Hamdi v. Rumsfeld (see June 28, 2004) that the US could not hold prisoners indefinitely without access to the US judicial system, and that the administration’s proposal that they be tried by military tribunals was unconstitutional (see June 28, 2004). [FindLaw, 10/9/2006] It is widely reported that the MCA does not directly apply to US citizens, but to only non-citizens defined as “enemy combatants. [CBS News, 10/19/2006] However, six months later, a Bush administration lawyer will confirm that the administration believes the law does indeed apply to US citizens (see February 1, 2007). Hassan Ghul, said to be an important al-Qaeda courier. 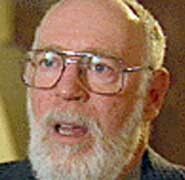 In 2005, ABC News reported he was being held in a secret CIA prison (see November 2005). Apparently, the CIA transferred Ghul to Pakistani custody in 2006 so he would not have to join other prisoners sent to the Guantantamo prison (see (Mid-2006)), and Pakistan released him in 2007, allowing him to rejoin al-Qaeda (see (Mid-2007)). 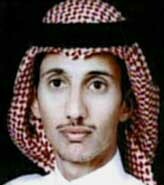 Ibn al-Shaykh al-Libi, a high-ranking al-Qaeda leader. The same ABC News report also mentioned him. Al-Libi was secretly transferred to Libya around 2006 (see Between November 2005 and September 2006) and will die there in 2009 under mysterious circumstances (see (May 10, 2009)). Mohammed Omar Abdul-Rahman, a son of the Blind Sheikh, Sheikh Omar Abdul-Rahman. The same ABC News report also mentioned him. He was reportedly captured in Pakistan in 2003 (see February 13, 2003). Ali Abd al-Rahman al-Faqasi al-Ghamdi, a.k.a. Abu Bakr al Azdi. He is said to be a candidate 9/11 hijacker who was held back for another operation. In 2004, the 9/11 Commission reported he was in US custody. Suleiman Abdalla Salim Hemed. Wanted for involvement in the 1998 African embassy bombings, he was reportedly captured in Somalia in March 2003. Witnesses claim to have seen him in two secret US prisons in 2004. Yassir al-Jazeeri. Said to be a high-ranking al-Qaeda leader, he was reportedly captured in Pakistan in March 2003. Witnesses later saw him in a secret CIA prison (see March 15, 2003). Musaad Aruchi, a nephew of Khalid Shaikh Mohammed. He was reported captured in Pakistan in June 2004 and then taken into CIA custody (see June 12, 2004). Sheikh Ahmed Salim Swedan. Wanted for a role in the African embassy bombings, there were various reports he was captured in Pakistan in 2002 and taken into US custody (see July 11, 2002). However, it appears these reports are false, because he will allegedly be killed in Pakistan in 2009 (see January 1, 2009). The American Civil Liberties Union (ACLU) and other human rights organizations release over a thousand pages of government documents obtained through the Freedom of Information Act (FOIA). The documents provide new details of the Bush administration’s treatment of prisoners in its “global war on terror.” Among other things, the documents show a much closer collaboration between the CIA and the Defense Department than initially believed; the Defense Department was intimately involved with the CIA’s practices of indefinite “ghost” detentions and torture. The documents confirm the existence of a previously “undisclosed detention facility” at Afghanistan’s Bagram Air Base and details of the extensive abuse and torture of prisoners at that facility. They also show that the Defense Department worked to keep the Red Cross away from its detainees by refusing to register their capture with the International Committee of the Red Cross (ICRC) for two weeks or more, “to maximize intelligence collection,” a practice the Defense Department officials acknowledged in their private communications to be illegal under the Geneva Conventions. Provisions for indefinite detention included in the 2012 “National Defense Authorization Act,” an annual ‘must pass’ defense spending bill, begin to generate controversy soon after the proposed text is published. The language drafted by the Senate Armed Services Committee provides for indefinite military detention, without charge or trial, of essentially anyone accused of supporting or being associated with groups “engaged in hostilities” with the United States, including US citizens. The American Civil Liberties Union (ACLU) begins monitoring the proceedings and urging the public to oppose the bill. [ACLU.org, 7/6/2011] Other civil liberties and human rights groups will follow suit, including Amnesty International, the Center for Constitutional Rights (CCR), Human Rights Watch (HRW), and the Bill of Rights Defense Committee. The ACLU, CCR, and HRW point out that indefinite detention without charge or trial has not been codified since the McCarthy era. [ConstitutionCampaign.org, 12/6/2011; HRW.org, 12/15/2011; CCRJustice.org, 1/4/2012; Amnesty International, 1/5/2012] Constitutional experts Jonathan Turley and Glenn Greenwald will repeatedly condemn the bill’s indefinite military detention provisions. [Jonathan Turley, 1/2/2012; Salon, 12/15/2012] Two retired four-star Marine Generals, Charles C. Krulak and Joseph P. Hoar, will criticize the NDAA’s indefinite detention provision in an op-ed published in the New York Times, writing that under the law, “Due process would be a thing of the past.” And, “[T]his provision would expand the battlefield to include the United States—and hand Osama bin Laden an unearned victory long after his well-earned demise.” [New York Times, 12/13/2011] Congress will pass the bill on December 15 (see December 15, 2011) and President Obama will sign it into law on December 31 (see December 31, 2011). A poll conducted shortly after the bill is passed by Congress will find that only one in four likely voters support the NDAA (see December 22-26, 2011). After the bill is signed into law, states and municipalities will begin to pass laws and resolutions opposing the bill (see December 31, 2011 and After).